A magnificent map featuring a carte-a-figures border with allegorical representations of the sun, the moon, the five known planets, the four elements and the four seasons. Along the bottom are vignettes showing the seven wonders of the world: the Hanging Gardens of Babylon, the Colossus straddling the harbor at Rhodes, the Pyramids, the Mausoleum of Halicarnassus at Cairo, the Temple of Diana, the Statue of Jupiter and the lighthouse at Alexandria. Josua van Ende engraved this map, reducing it from Blaeu's 1605 wall map for inclusion in atlases. 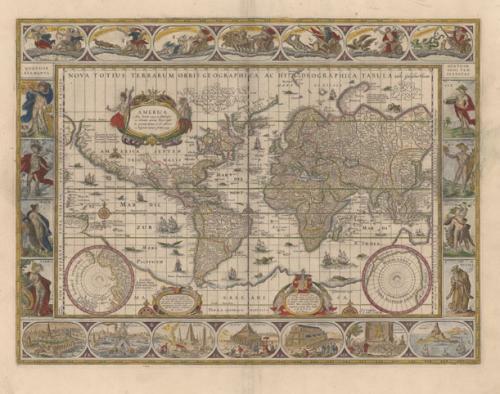 Petrus Plancius' world map of 1592 was the main source of geographical information. The map is shown on Mercator's projection with a massive Southern Continent attached to New Guinea, with the coastal names of Beachand Psittacorum regio noted from Marco Polo's travel memoirs. North America has the westward bulge characteristic of the time, with the Strait of Aniannoted. Korea is shown as an island and Japan is in a kite-like shape. The map itself is richly decorated with cartouches, sea battles, monsters and compass roses. Fourth state with Tierra del Fuego shown as an island and the date omitted from the lower cartouche on the right. German text on verso. A nice impression with attractive colour printed on heavy paper with generous margins and minor soiling. There are minor abrasions in several of the side panels (primarily Air and Summer). Ref: Goss (Blaeu) #1; Shirley #255.